Former PM continues to blast Netanyahu, but stresses he's not planning a return to politics at this time. 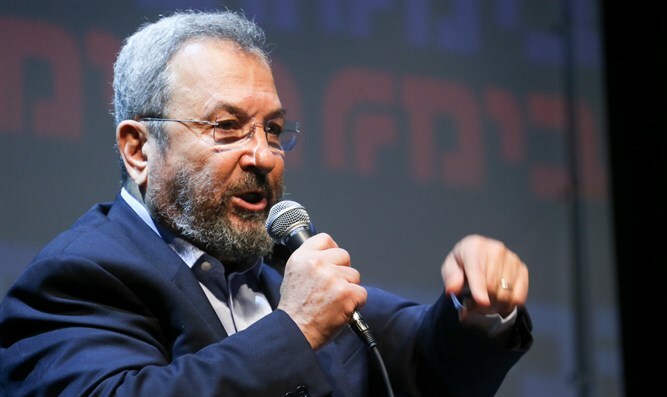 Former Prime Minister and Defense Minister Ehud Barak on Thursday verbally attacked Prime Minister Binyamin Netanyahu, even as he made clear he does not intend to return to politics. Speaking in an interview on the Kol Barama radio station, Barak was asked about the weekly leftist protests in Petah Tikva against Attorney General Avichai Mandelblit. "There were also demonstrations against me. The public is allowed to express its opinion, and it is good that the Supreme Court backs the right to demonstrate,” he said. Barak referred to Iran's attempts to establish itself in Syria and to Netanyahu's meeting with Russian President Vladimir Putin on Wednesday, which dealt with that issue. "I say unequivocally that it was possible to do much more. Netanyahu went to Sochi like a beggar. Putin will not change Russia's policy on the issue and Trump also did not speak out unequivocally about it," Barak charged. "There has been a political initiative with the Sunni countries on the table for two and a half years and nothing has been done – all talk," he added. At the same time, Barak ruled out a return to politics, telling the station, "Right now I'm not going back to politics, but you never say never in politics." He blasted Netanyahu's policy and said that "the one who gave away parts of Hevron is Netanyahu. I did not give away anything, I only talked with those who wanted to talk." "The right-wing government, headed by Netanyahu, is misleading the public. They are causing harm every day with their activities in the isolated settlements and with the lack of action vis-a-vis the diplomatic initiatives, while undermining the security of the state," claimed Barak. Barak has continuously blasted Netanyahu and his government, despite once splitting the Labor party and forming the short-lived Independence party so he could continue to serve as Netanyahu's Defense Minister. The former Prime Minister recently accused the government of leading towards a reality of one state with an Arab majority. Despite his claims that he is not returning to politics at this time, a recent report indicated that Barak and Labor chairman Avi Gabbay have been in talks recently regarding Barak's return to political life and his possible inclusion in the Zionist Union’s Knesset list for the next election. Previous reports indicated that Barak had tried – unsuccessfully – to convince other candidates withdraw from the race for the Labor leadership and support him instead.